You plan your Disney vacation months and sometimes a year in advance with hopes of it being the most magical vacation. You look at the weather forecast expecting to see nothing but that wonderful Florida sunshine, only to see rain. You think your vacation is ruined, but it’s not! Here are some tips for rainy days at Walt Disney World. While the Mickey Mouse ponchos are super cute they are a tad pricey. You can purchase a plain one at home for only a few dollars. Ponchos are great alternative to a typical rain jacket especially in the summer months in Florida. They take up little room in a bag and can easily fit over a backpack keeping it dry. 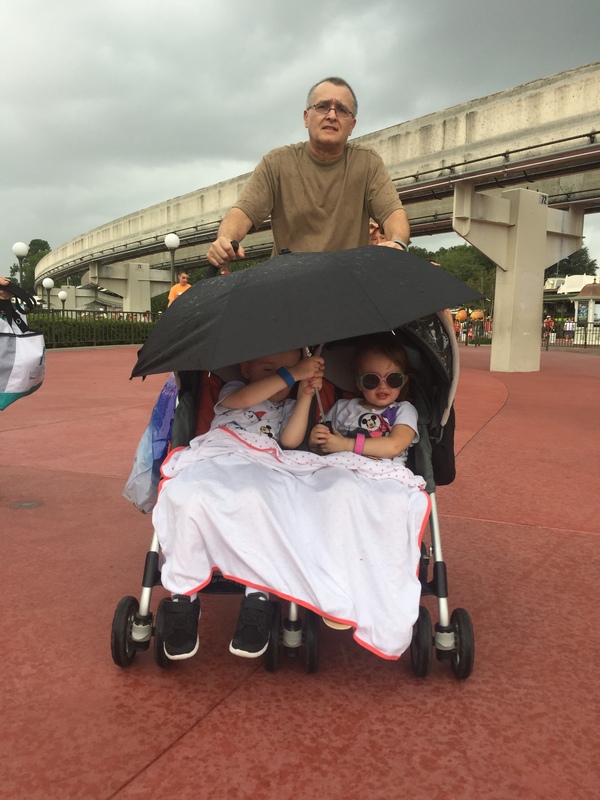 If you aren’t a fan of the ponchos pack an umbrella instead. You will be happy you did. When it starts to rain take out your rain gear and keep on moving. Using a backpack while visiting Disney parks is ideal for people with our without children. You want to make sure you have a place to put your rain gear and other must bring items. A small backpack works just fine. You don’t want to be lugging around a huge bag all day. If the temperature allows, pack a pair of flip flops on those rainy park days. Switch out your socks and sneakers for flip flops to keep your walking shoes dry. This will help prevent any unwanted blisters and soggy socks. Pack a gallon sized Ziploc bag to place your wet flip flops in so they don’t get your backpack wet. Wear light clothing that will dry quickly. In the chilly months pack a lightweight waterproof jacket instead of a cotton hoodie or sweatshirt that will stay wet. I’m a fan of active wear that is designed to wick away moisture. Use this time to grab a bite to eat and get out of the rain. You can utilize this time to regroup or to take a breather. Quick serve food locations are typically busier when it is raining. Be prepared to stand in line. The ride queues drop a good amount when it rains. People who are unprepared for the weather will generally take cover and not ride the rides. This is the perfect opportunity if you have rain gear to get on rides that typically have a longer wait. It is also a great time to ride rides without using FastPasses. 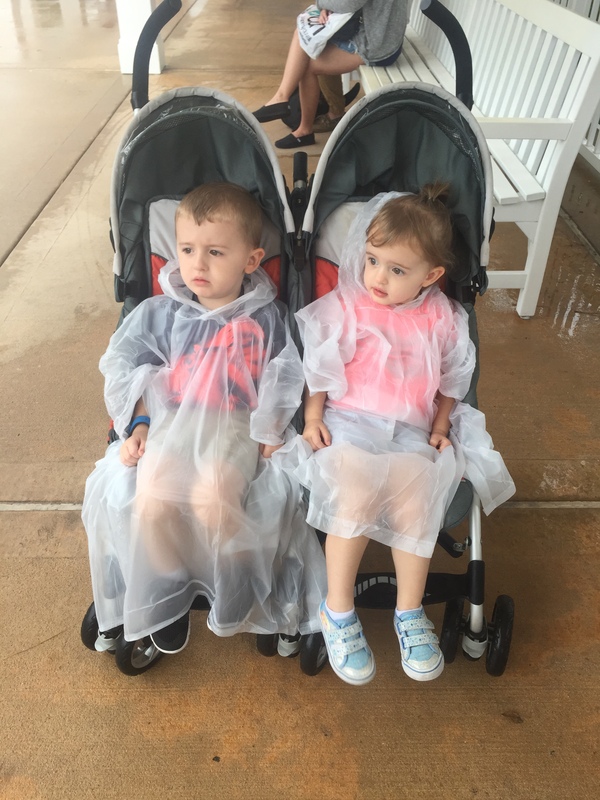 Rainy days are great days to get your Disney shopping done. Stay dry by popping into various stores. It can get addicting! If you don’t have enough room in your luggage for everything you bought, Disney can ship items to your home. If it looks like it is going to rain for a while head to Disney Springs. There is plenty to do there while staying dry. Go bowling at Splitsville or enjoy a movie at AMC dine-in. There are over 150 stores and restaurants for you to explore. You can always head back to your resort to take a nap and be refreshed for later activities. The deluxe resorts have on-site spas and health clubs. Schedule a massage or facial and pamper yourself. You are in the most magical place on Earth! Don’t let the weather get you down. Be prepared, keep moving, smile, and look for pixie dust! 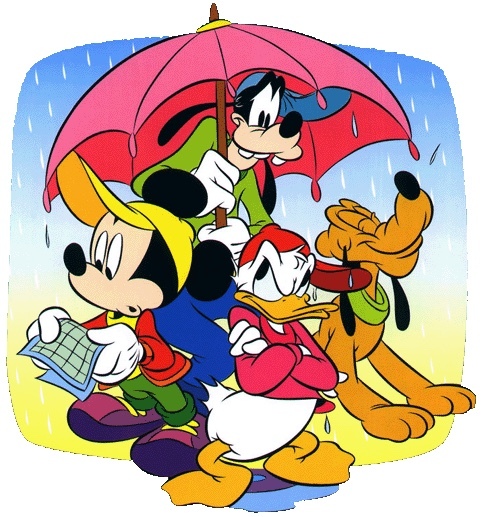 And if you’re lucky, you might be able to see Magic Kingdom’s Rainy Day Parade!